Tropical depression Seniang has intensified into a storm and made landfall over Hinatuan, Surigao del Sur, Monday morning, December 29. In its 11 a.m. bulletin, state weather bureau PAGASA said Bagyong Seniang has maintained its strength and is now moving towards Agusan Del Norte. As of 10 a.m., its eye was spotted 33 kilometers Northeast of Butuan City or 30 km East of Cabadbaran City, packing maximum sustained winds of 65 kilometers per hour near the center and gusts of up to 80 kph. State forecasters said the estimated rainfall amount is from 15 to 30 millimeters per hour (heavy to intense) within its 300-km diameter. Residents in low lying and mountainous areas of the provinces with storm warning signals especially Caraga Region as well as over the rest of Visayas and of Mindanao are alerted against possible flashfloods and landslides. 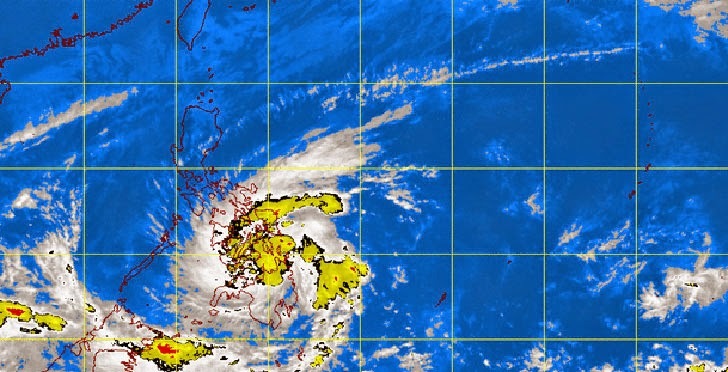 Ocean waves may reach up to 5 meters, PAGASA said, adding that fisherfolks and those with small seacrafts are advised not to venture out over the eastern seaboards of Luzon and the seaboard of Visayas and over the northern and eastern seaboards of Mindanao.